Better Enterprise Height Adjustable Mobile Laptop Cart (Foot Pedal) is designed to make it easy for healthcare providers to integrate information and technology in existing medical spaces with easy mobility and effortless maneuverability and to fit the ergonomic needs of a standing or seated work position. Your laptop is securely stored in the enclosure with flip up top to prevent theft and misuse through keyed locks on left and right sides. The locking enclosure can accommodate various sizes of laptop up to 17”. 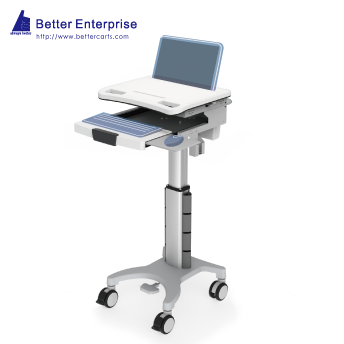 Height Adjustable Mobile Laptop Cart (Foot Pedal) features the slide-out key board tray with mouse tray which can either slide left or right to accommodate left and right handed users. The sturdy 4-Prongs aluminum die casting base for Height Adjustable Mobile Laptop Cart (Foot Pedal) creates easier and more stable mobility with elegant outlook which overpowers other brands who are still offering furniture base or chair base. The optional counter weight gives better performance with much heavier devices. 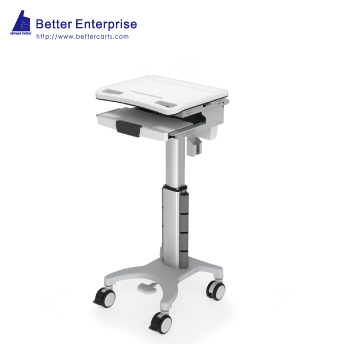 ● Better Enterprise is Laptop Cart manufacturer, Height Adjustable Laptop Cart supplier, and supplying professional Laptop Cart, Height Adjustable Laptop Cart products. Welcome contact Laptop Cart, Height Adjustable Laptop Cart Manufacturer.